One thing you should know about numbers in Arma is that they adhere to IEEE floating point standard. Go ahead and look it up on wikipedia for details, but in layman’s terms this means that there is a limit after which the numbers start losing their precision, among other things like -1 x 0 = – 0 (though 0 == – 0 returns true). Because of that, the floats converted to string will drastically reduce precision the greater they are. 9.99999 has 5 digits after floating point while 99999.9 has only 1. Why is this a problem? The position coordinates of objects are in metres and they are floats too. If my X coordinate displays 1234.12, this means I’m one kilometre, two hundred and thirty four metres and twelve centimetres away from the map origin, which is [0,0,0]. So here is the challenge, how to convert float to string without losing precision needed for the map placement? We know the floats stored as numbers preserve their precision. To check it I will store my X coordinate in a variable as a number and then subtract a default 6 digit rounded variant from it. This gives us 2475.52832, which is little bit different from 2475.52829102. Will this be enough? A final test to make sure everything works. This time we measure the distance between 2 positions. If the distance between the original position and stored position is 0 we are spot on. Hi – first off I appreciate your work. I needed to let you know that sometimes the results of this function are unreliable. I wanted to let you know in case you need to fix something. 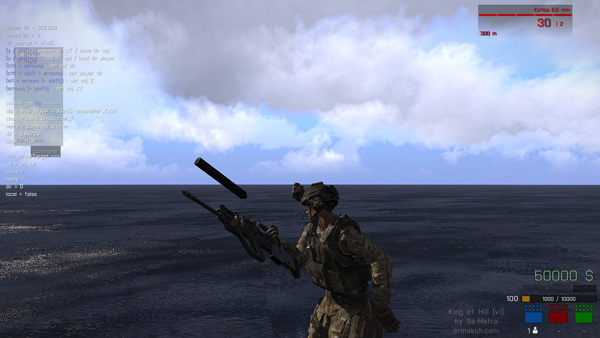 Personally, I think it’s something to do with how Arma handles the % (mod command). I’ve seen some weirdness in other things I’ve been using % for. Looks like only neg values are affected though with the decimal in the wrong place. Haha! Thanks for testing, I quite enjoyed solving this one without resorting to “if then”. I hope this is it. Actually when new string commands come out I might come back and write a better function. Thanks for your continued support. Appreciate the help with projects I’m working on. Is this functionality still required now that we have get/setPosWorld? Happy to test myself of course but figured I’d jump in and ask so others get the benefit of the response. Comments I’ve seen suggest that Z height is more accurate, but not sure about X/Y. I note you were commenting on SaMatra’s original ticket about this so probably know! For some weird reason i end up having quotes around my array….ending with something like this: [336.253,”[6028.168945,1444.422974,0.370625]“]. Is there a way i can convert it to this: [336.253,[6028.168945,1444.422974,0.370625]] ? You have to call compile before you use it. It is a string, this is why you have quotes, and no it won’t lose precision. If i try and save the pos2str in the database it adds those quotes like the 1st post i made. I am not actually trying to save player coordinates…I SELECT the world coordinates from an object, then get just the x,y,z without the direction, then do your trick to get a better decimal point….and when i insert it back to the database it adds the quotes. It doesn’t. I have covered this already in my blogs. What you see when you display number on screen is not what the number is, the screen representation rounds it, the actual number preserves precision. I understand what you mean….but i am importing the data in the database (after the functions) and i see truncated digits. If i do a simple example like _str = “234.23423″; and then use that instead then call compiling keeps the digits….but the minute i call compile the data coming out of the function…it gets trimmed. its really weird. You absolutely cannot do that if you want precision, If you call compile before calling extension, you will get game type array, and that is fine because array contains precision, but as soon as you pass it to extension, that expects game type string, your array values will get rounded. This is why my function returns string, so that you can pass it to extension unchanged. Do you get it now?